What’s Up With The Swiss Franc? After a rather predictable ebb and flow upward, it appears the Swiss Franc (FXF) has gone on a climax run with it’s break of the channel on massive volume. 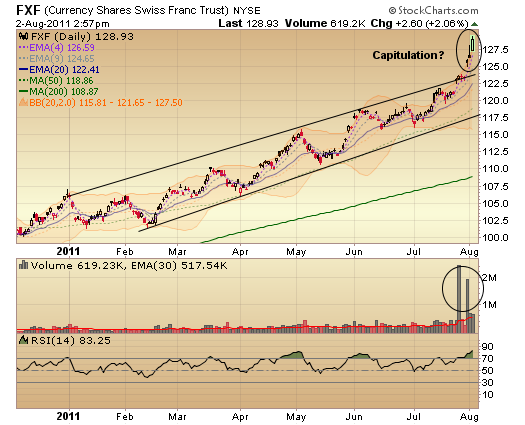 Currencies trusts are difficult to chart and I see a breakdown after a breakout more often than not. That volume is suspicious and it’s likely this doesn’t have much upside left. I would not short this as I never short strength, but if I was long I’d be banking the majority of my profits and looking for opportunities elsewhere.